When I was searching ideas to decorate the nursery room for our boy, I found a big set of wall stickers that I felt in love with from the first sight. An underwater theme with fish and bubbles by FunToSee. I painted the half walls light blue and I made big curves in the surface to look like big waves. The decoration was really successful and the nursery looked very beautiful. • Remove a small piece in the edge of the backing and stick it to the desirable higher point and then start removing the rest backing slowly and apply gradually the sticker. • With a plastic card that is usually included in the package, smooth their surface by pressing the stickers and pushing air bubbles out. 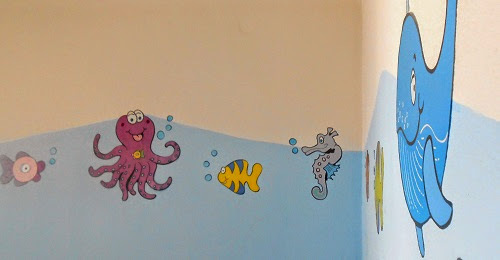 Follow ARTbyJWP • Joanna Papanikolaou's board Inspiration • Kids Room & Nurseries on Pinterest. Wish all a beautiful day ... xoxo!!! Christina Makri 20 Μαΐ 2014, 1:26:00 μ.μ. Dimitra Decorasylum 20 Μαΐ 2014, 2:25:00 μ.μ. Zina Z 20 Μαΐ 2014, 3:51:00 μ.μ. Luna Made by Luna 20 Μαΐ 2014, 8:48:00 μ.μ. Eleana-My Home My Memories 20 Μαΐ 2014, 9:11:00 μ.μ. :) Οι φωτογραφίες με τα ζωάκια έχουν πλάκα!! :)) To είχα σκεφτεί και εγώ πέρυσι για τη κρεβατοκάμαρα μας, ήταν η πιο οικονομική λύση αντί καμβάδες που ήθελα να βάλω και κοστίζανε. Τελικά δε το έκανα για να μην με κυνηγάει ο ιδιοκτήτης αλλά αφού τα καταφέρνει ο μικρός σου ;) Φιλιά Ιωάννα! !